Gold Preliminary. Coursebook. Exam Maximiser. Teacher's Book. Unit 10 What's it worth? 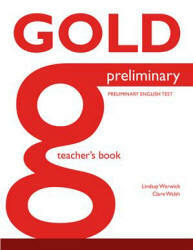 The Cambridge English: Preliminary exam is made up of three papers, each testing a different area of ability in English. Paper 1: Reading and Writing is worth 50 percent of the total mark. Paper 2: Listening and Paper 3: Speaking are each worth 25 percent of the mark. Paper 1 has two sections. The Reading section has five parts (35 questions) and is worth 25 percent of the final exam mark. The Writing section has three parts and is also worth 25 percent of the final exam mark. Each part tests different reading and writing skills. The Listening Paper has four parts, with a total of 25 questions. It is worth 25 percent of the final mark. You hear each recording twice. There are four parts to the Speaking Test. You take the Speaking Test with another candidate, and there will be two examiners. One examiner asks the questions and the other examiner just listens. Welcome to Gold Preliminary, an innovative and engaging course for students preparing to sit Cambridge English: Preliminary or working at B1 on the common European framework. Gold Preliminary follows a similar identity and approach to the previous Going for Gold Intermediate, but with all new content more clearly aligned to the exam. Rich authentic texts, carefully chosen to appeal to adults and older teenagers, provide the basis for lessons that will captivate the interest of both students and teachers alike. A well-prepared Preliminary student will enter the exam confident both of their English level and the best strategies to approach each task. 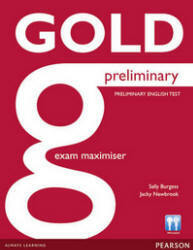 Students will finish the Gold Preliminary course confident of what to expect in the Exam from the detailed Exam focus section and tips for every practice task. In addition, there is an extensive Writing reference section with sample graded answers and comments, and useful language for each genre. The Gold Preliminary package combines a suite of printed and digital components that can be used individually or in a multitude of combinations to suit the learner's needs and the technology available. The table on page 7 gives an overview of how the components available with Gold Preliminary fit together. The Teacher's notes include many ideas for how and when to integrate the different components to provide a seamlessly integrated and easy-to-use course package that both tech-savvy teachers and those using an interactive whiteboard for the first time will find invaluable.